OPINION: Taranaki is just 31 days away from experiencing lower airfares, and more air competition as Jetstar prepares to take on the region on 1 February 2016. Recognition at the opening of 25 million dollar Novotel Hobson Hotel in New Plymouth that Jetstar services would boost demand among leisure and corporate bookings. 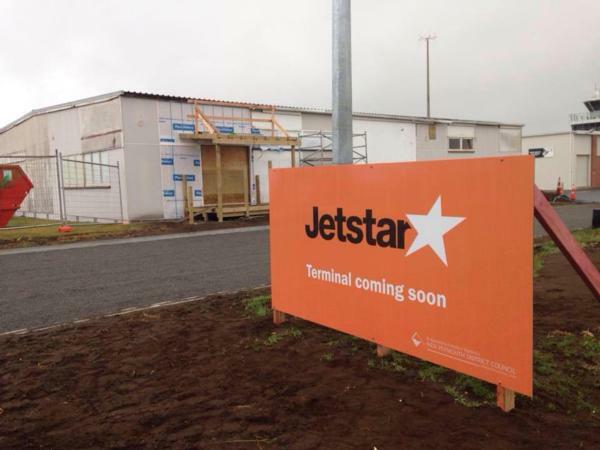 An exclusive Jetstar terminal being installed at New Plymouth Airport with help from the New Plymouth District Council. Recognition from Taranaki's largest annual event WOMAD that they're expecting to sell out due to lower travel costs thanks to Jetstar. Later in 2015 Jetstar Airways announced New Plymouth Airport would be their new regional destination for the low cost carrier, with a direct Auckland service four times daily. The flights would be the lowest over Jetstar's entire travel network with flights starting at $29 meaning international travel to Australia and Rarotonga would also be significantly cheaper. The low travel cost meant Air New Zealand were heavily restricted as to what they could charge on their non-direct flights to locations such as Nelson, Napier, Queenstown and Dunedin from New Plymouth. Air New Zealand are also price restricted on their direct Wellington and Christchurch services because passengers would not fly Air New Zealand if it were cheaper to fly Jetstar via Auckland to those locations. Jetstar has already dedicated thousands of dollars into the Taranaki region on marketing and promotion, and that's expected to rise as Air New Zealand try and beef up the anti. Recently Air New Zealand installed an large scale billboard in central New Plymouth stating the national carrier was "still the warmest welcome in New Zealand". Jetstar hit back by grabbing all of the advertising spaces left at New Plymouth Airport to show an dominance in pride of their regional services. Jetstar is expected to have an huge airport launch in New Plymouth on 1 February with hundreds expected to turn out to see the first Jetstar flight take off. This all happening as Air New Zealand closes their only New Plymouth holiday store, cutting more than ten jobs. But don't stop there - an airline insider for Origin Air has told Community Taranaki that New Plymouth should prepare for direct Origin Air flights out of New Plymouth Airport in early 2016. Origin own two twin-turbo prop pressurized 19 seater planes, similar to Air New Zealand's 19 seater Beechcraft fleet which makes the new airlines entrance into the Taranaki air market so vital. It's predicted Origin Air will provide at least, a direct service to Nelson from New Plymouth.